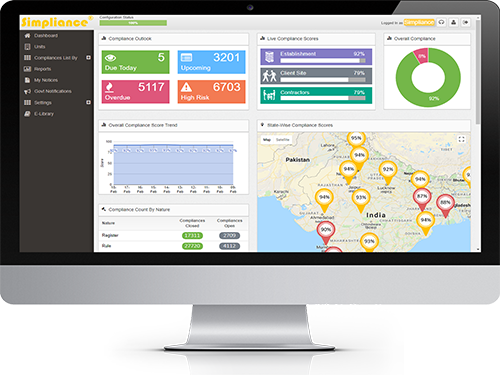 Simpliance’s Environmental, Health, and Safety software tools help organizations to minimize risks for a safe environment and comply with appropriate EHS regulations applicable in India. The software provides a number of benefits for organizations including reducing risks linked with environmental regulations, minimizing the firm's environmental impact, and enhancing workplace safety for employees. EHS compliance is an ongoing process that becomes complex for business and facility managers with limited resources. Simpliance provides you with consulting services to create, implement and monitor policies and procedures to comply with environmental health and safety laws, regulations, and standards. The tool auto-configures EHS safety compliance along with recurring activities, evidence management, scores and email alerts. Simpliance's intelligent compliance engine consolidates and auto-configures all central and state EHS safety laws. It schedules recurring compliances in a single unified cloud platform. A 'drilled-down' live dashboard provides real-time status of all EHS compliances with risk scores in the company. Detailed information on the compliance requirement, recurrence and penalties for non-adherence along with all relevant collaterals for execution of the compliance. Evidence Management, audit log and history enable intuitive compliance, faster completion and easy retrieval of previous compliances & evidences.